During today's ongoing study of insects, we brought out the microscopes. We have several prepared slides of various insect parts, and used those to further continue studying the insect parts we're reading about this week such as the legs, wings, head, etc. We also have various parts from a wasp which we squashed after he found his way into the house. His legs and wings are by far the coolest we've seen! We rely heavily on the Handbook of Nature Study by Anna Botsford Comstock to further our study of various insects. If you enjoy nature studies, this book is a must have. Today we collected mosquito larvae from a container outside and observed their behavior. We read about the different stages of the mosquitos, and made sure to collect both a larvae and a pupa. Then, in the name of science, I added flea spray to their water and killed them so that we could study them under the microscope. It was impossible to do so while they were living because they simply wouldn't stay still long enough. Suffice it to say that I don't think we will EVER look at mosquito larvae the same again. Here is a close up of our specimens. The long skinny one is the mosquito larvae, and the fat rounder one is the pupa. He is getting close to hatching and becoming a full grown, blood thirsty mosquito. Makes me not feel so bad about his death. In case your interested in doing your own nature studies, I highly recommend doing the Outdoor Hour Challenges hosted here. Our mosquito study was the first challenge in her summer challenge series. Week in Review - Frogs, fruit & fun! This week was our first week back to our regular school schedule. If you read my earlier post, we've decided to try a more year round school schedule. I like short sessions with more breaks built in throughout the year, rather than going for 9 months and then getting 2 months off in the summer. The frogs finally arrived! We have been waiting since March 19th for these cute little guys! Here's a look back at their growth over the past three months. Three days after we collected them and the eggs are already changing! Two days later and they've hatched. I put this tiny guy into a petri dish so that I could get a good picture of him. Shortly thereafter, after watching them for 3 months and 6 days, success! A frog!! Is he cute or what? We have fruit! We have a bunch of cantaloupes and watermelons growing in our small garden. We have tiny watermelons growing five feet off the ground. The largest one is about two feet up. I can't wait until they get huge! What a sight that will be. This is a science experiment in itself! Who thinks the vines will hold? I've been assured that they will. We saw HUGE pumpkins growing about 8 feet off the ground at Epcot. The boys are so excited. The cantaloupes are Ryan's, and the watermelons are Adam's. I realize everyone's probably sick and tired of my bug pictures by now, but seeing as we're studying them at the moment, I seem to have created a new obsession. I figure we'll have lots of cool pictures for our insect notebooking pages, or at the very least, subjects to use while drawing in our journals. Regardless, its rather fun to go outside and see what you can find. Even with the unbearable heat, I've managed to drag the kids outside for a few minutes to do a nature study. Here are some of our recent discoveries. This guy is rather creepy looking, but considering its just the exoskeleton, completely harmless. 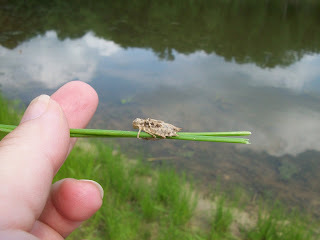 If you didn't know already, its a cicada. My boys were endlessly fascinated with it, especially since putting it anywhere within sight distance of their sister is sure to elicit screams of pure terror. Somebody please explain to me why someone would be terrified of something that isn't even alive and couldn't hurt you even if it was. After reading about them, and listening to them outside, Adam has announced that they are his favorite "insect music". Better yet was the fact that we had just read about exoskeletons, and then managed to find one of the largest ones around. Not bad for a few minutes walk! The praying mantis...so cool, yet so freaky. There is just something about an insect that can turn its head and look at you with those bulging eyes and grinding mandibles that just gives me the creeps. I do think they're totally cool though. We even raised a bunch of them a couple of years ago. We purchased an egg case and watched it for what seemed like FOREVER, to wake up one day to find what looked like thousands of tiny mantises crawling all over their enclosure. My daughter and I let them go outside, after she let them crawl all over her ((YUCK)), and I always wonder if the ones we find now are relatives of the ones we hatched. Wouldn't that be cool? This one is by far my favorite. He was busy eating and pollinating to his heart's content on my butterfly bush. He is a Snowberry Clearwing Hummingbird Moth. He looks an awful lot like a bumblebee, but he flies like a hummingbird. He's quite friendly and will come right up to you just to say hi. The kids were rather intimidated by him because of his resemblance to a bee. This year we're trying something a bit different with our schoolwork. We're not taking the usual two month long Summer break. To be honest, we get bored. Maybe I should rephrase that to say that I get bored. I've been looking into changing our 2010/2011 school year to something resembling a year round schedule. I have found that the kids get so out of the school mind frame that it takes forever to get them back into the routine. Without that long break I'm hoping to avoid that. Another added bonus is that it allows us to take more breaks throughout the year. I really need that. With a year round schedule, we can have a week break almost every month and still go over our 180 days that I'm required to teach. It allows us to have a much more flexible schedule overall. 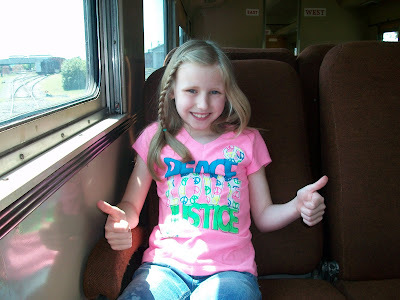 We finished up our 2009/2010 school year in mid May, took the end of May and the first two weeks of June off, and will be starting back to school on Monday. The month of July will be a bit sparse with the twins' birthday and other Summer activities, but we will be having school none the less. What does your school year look like? We had a busy week this time. Tuesday was Haley's 10th birthday, and we spent that day at the mall where we went to all her favorite stores and went to lunch at the restaurant of her choice. 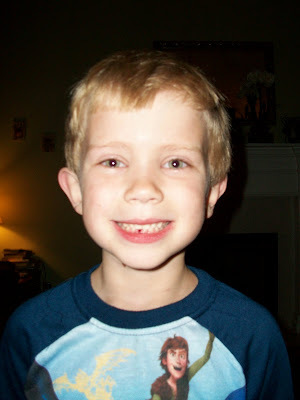 That night was a big event too, since Adam's loose tooth finally decided to come out. It had been loose since April, and his permanent tooth was already in right behind the baby tooth. This was his first tooth to fall out, and he's almost 7! He was so proud! 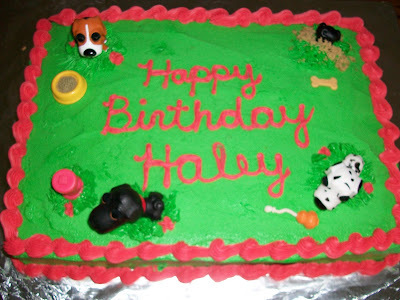 I spent several days toward the end of the week making Haley's cake for her party on Saturday. I make everything from scratch, so it does take some planning. 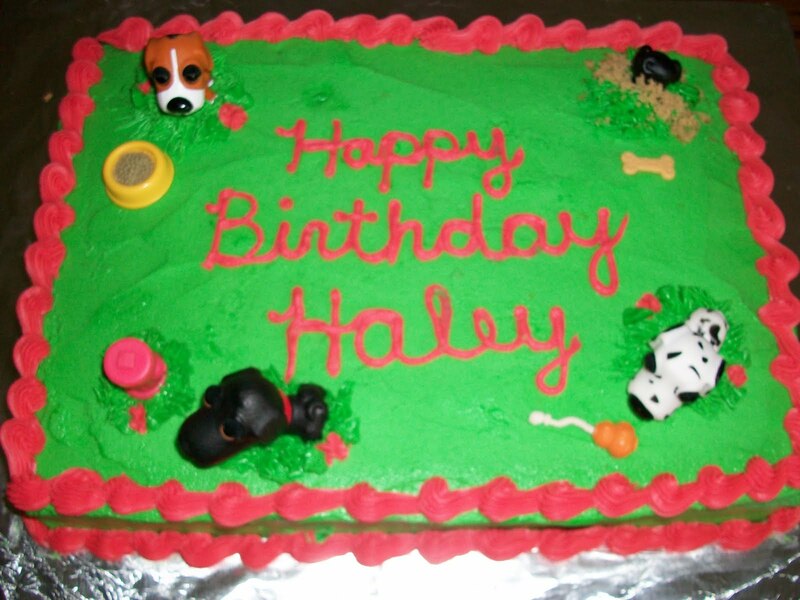 She wanted a dog themed party, and was quite pleased with how her cake turned out. On Saturday, we had her party. 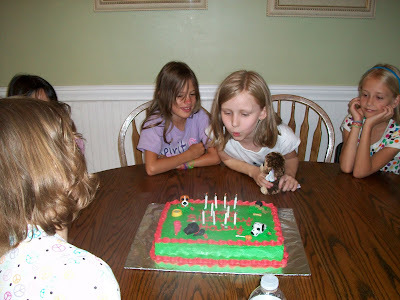 She had a bunch of her friends over for a playdate, with cake, ice cream, and dog bone shaped cookies. She managed to blow out all 10 candles on the first try! Today my baby girl turns 10. Never will she be a single digit again. She's super excited, but me, not so much. Its sad in a way. They grow up whether you're ready for it or not. Its just so hard to believe that its been 10 years since I first looked into her precious baby face. She was a dream come true for me. I prayed and prayed for a baby girl and God gave me Haley. Yes, maybe she's a bit spoiled, sometimes a bit difficult, but she's still my baby girl and I love her without question. She is a gift from God and I treasure her as such. So, as I sit here with tears in my eyes thinking about what used to be, remembering that sweet little bundle you were, I also think ahead (with some serious trepidation) to the bright future ahead of you. Happy 10th birthday baby girl!! Several of my friends and I went to see this movie over the weekend. My mother saw it just after it came out and absolutely LOVED it. She hates just about all movies, so I just had to go. I have to say though that I'm somewhat biased because I love sappy romance stories, and I'm a big Amanda Seyfried fan. But, regardless of all that, we all loved the movie. Who doesn't love happy endings, right? My mother said that it did make her cry at all, but sappy me cried quite a bit. Be prepared and bring tissues. This is one of those movies that I will most likely add to my movie collection when it comes out on DVD. If you haven't seen the trailer yet, you can check it out here. Not too much going on here as we're enjoying a nice Summer break. Its nice to be able to refresh and revive before jumping back in to school again. We will be starting back on a light schedule in another week. In the past we've always taken a normal Summer break, but is so hard to get back in "school mode" after 2 months off that I'm going to try doing a more year round schedule this year. We did some birthday shopping for the kids on Monday with my step mother in law, followed by lunch at Dairy Queen. This was the first time that I had ever eaten there. Sad, seeing that I'm 40. Tuesday and Wednesday were spent being lazy at home. Sleeping late, getting caught up on house work, swimming, watching it rain...I'm starting to feel like we've been transplanted to Florida or something. These afternoon thunderstorms are getting old! My garden is enjoying the water though. Thursday we went on a walking tour of our town. It was super hot and humid, but we learned lots of interesting history. For instance, I just discovered that Dolly Parton was married here in 1966. Who knew? After the tour we had lunch with a fellow homeschooler and the author of one of my all time favorite blogs. You can check her out here. Friday I had a nice relaxing mom's day out with some of my other homeschooling friends. We went shopping and had lunch at Olive Garden. YUM! It was so nice to be able to go into shops with lots of breakable things and not have to be saying "don't touch that", "put that down" and "no" every five seconds. My kids had a great day too, playing with their friends. Lastly, I'll share a picture of our newest resident. She came home yesterday. We've been waiting for her to be old enough since the day she was born! My neighbor's cat had 4 kittens on the day they left town for several days. I was on kitty duty at the time. So, we had the honor of meeting the new arrivals on the day they were born, and kitten sitting until their owners returned. 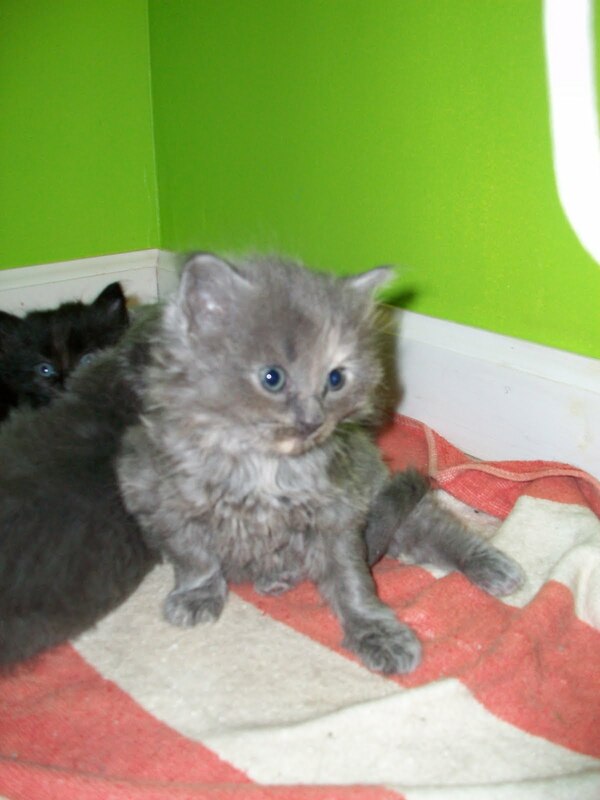 We've also been able to watch them grow each week and to kitten sit on several weekends recently. Anyway, she came home yesterday and we're all in love with her! We've named her Anabel which is a form of Amabel which according to my baby book means loveable in Latin. I think its fitting. We just love making pocket books whenever possible. Evan Moore produces these books and you can find them for just about every subject. I tend to get mine from one of my favorite sites, Teacher File Box. You can also find them on Currclick. In the past we've made them while studying whales, and again while studying animal migration. 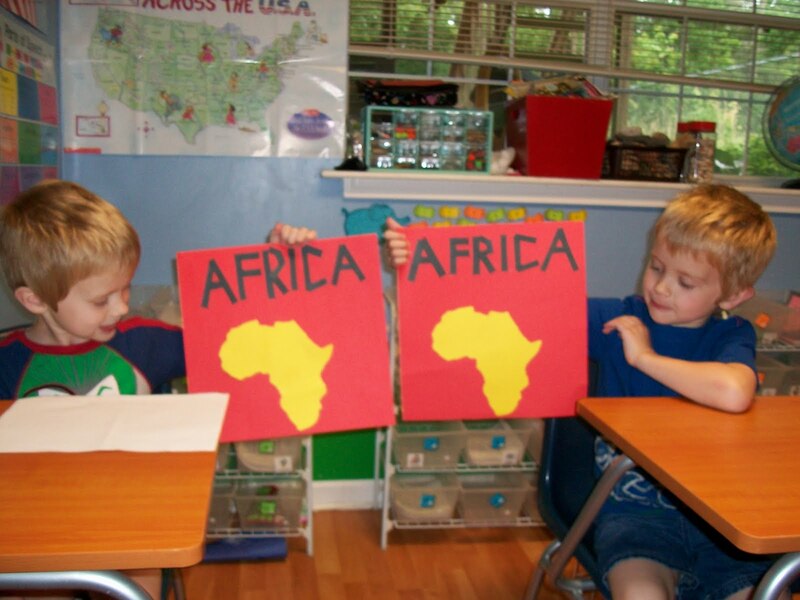 At the moment we're using them while studying Africa. We started out by making the outside covers. Then, we started making the pockets. Each pocket concentrates on a different topic, with the first being about African Animals. When you complete all of the pockets, you end up with a wonderful permanent keepsake of what you learned. 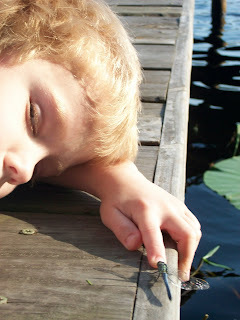 We've spent several wonderful afternoons studying nature at the pond near our house. We were able to see so many interesting things! A couple of months ago we noticed these strange looking creatures in the water of the pond. They looked similar to a cricket, but lived in the water. I thought they were probably dragon fly nymphs, and this proved to be true. When we were at the pond recently, we found the exoskeletons of those same nymphs. 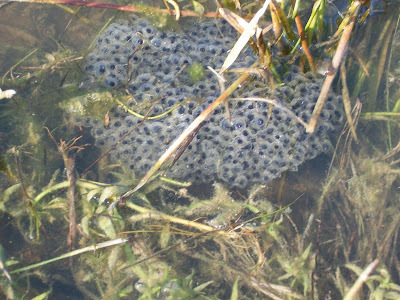 They were literally everywhere on the grass surrounding the pond. My kids are particularly interested in dragon flies after our recent trip to their grandparent's house in Florida. There were dragon flies everywhere demonstrating their incredible flying ability over the lake there. They were even able to get up close and personal with one particular dragon fly for quite some time. 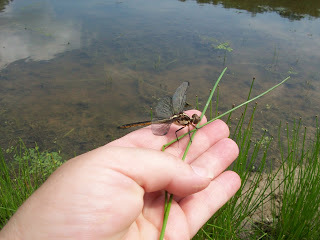 While at the pond, we came across a large dragon fly that only had 3 wings instead of the normal 4. He let me hold him and the kids were able to study him. Very cool! In addition to the dragon flies, we also saw lots of "interesting" spiders, and more tiny frogs than we could count. 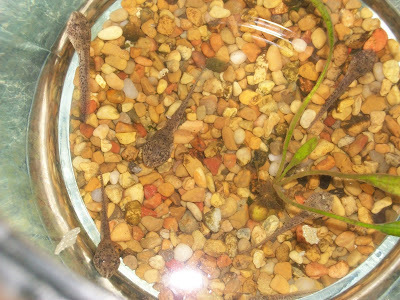 It was really neat considering that we have tadpoles from this very same pond at home. Ours are just starting to develop their legs, whereas these were already frogs. They were so tiny! Each one was about the size of my pinky finger nail. 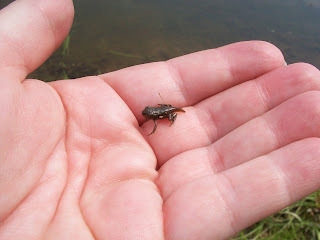 We also found one tiny frog that had obviously just crawled out of the water. He was darker, smaller and still had quite a bit of his tail. 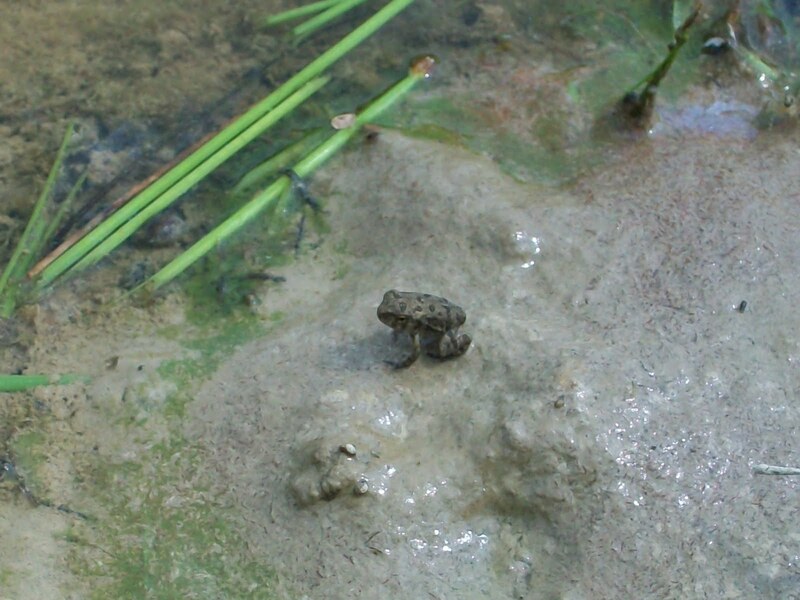 It was really cool for the kids to be able to see all of the stages of the frogs, from the eggs we collected, to tiny tadpoles with gills, large tadpoles with emerging legs, tiny frogs with a partial tail still attached, to finally a fully developed tiny frog. Better yet, we have pictures of each and every stage! Yes, its that time again. My daughter's 10th birthday is fast approaching and we've barely begun to plan it. Why is it that I always procrastinate until the very last minute before finally getting around to planning? Maybe its not a bad thing since she tends to change her mind about the theme of the party frequently. I think we've finally settled on a puppy/dog theme. She wanted to do a Hannah Montana theme, but seeing as I'm not 100% behind the whole Hannah Montana craze, I talked her out of it. I don't mind if she wants to have a few of her songs (with my prior review and approval) on her ipod, but I certainly don't want her making Hannah her role model for her life or anything. 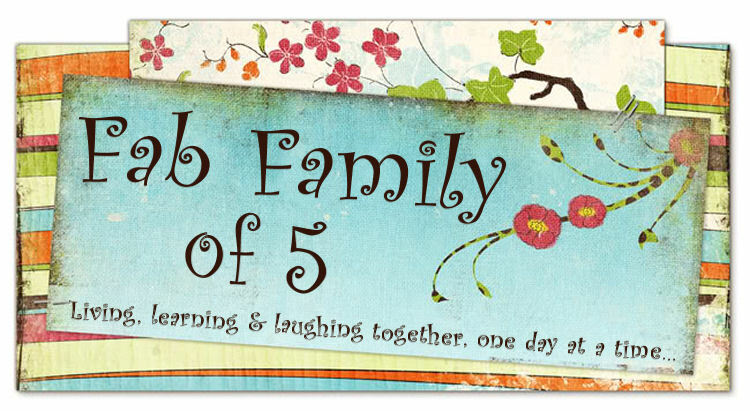 So today we're hopefully making a trek to the party supply store and purchasing invitations, plates, cups, napkins, etc. I suppose we also need to order a cake topper of some sort. 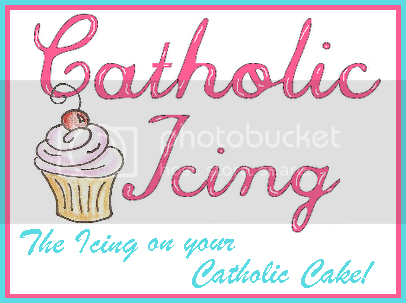 I'm making her cake this year and it will indeed be a labor intensive, multi day event. Its something I'm really interested in though, so I enjoy it. Besides, I think my kids enjoy me making something special just for them. Her party will mainly be a glorified play date with cake and ice cream. What does your family do for birthdays?